Current: Q1, 2011 – And hasn’t reach our shores yet. This new Tokina lens is the first in a new generation of full frame (FX) lenses designed for professional digital SLR cameras like the Canon EOS 5D Mark II and the Nikon D700 and D3x. The 16-28 zoom range gives the professional photographer a super-wide angle of view to get close to subject for dramatic effect or to take in entire scenes. 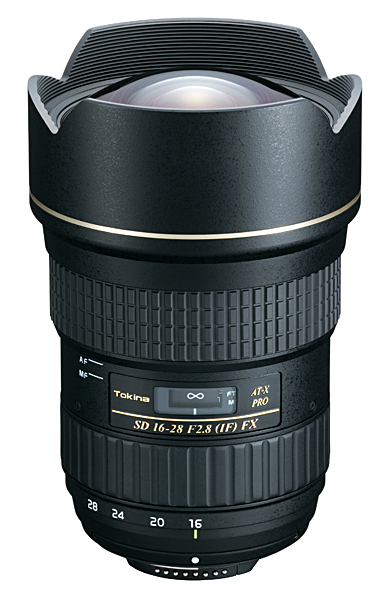 The 16-28 f/2.8 uses a newly developed silent DC motor that allows the lens to focus faster and more quietly then previous generations. The DC motor coupled with a new GMR magnetic AF sensor work together to increase AF Speed. Tokina’s exclusive One-touch Focus Clutch Mechanism allows the photographer to switch between AF and MF simply by snapping the focus ring forward for AF and back toward the camera to focus manually. There is no need to change the AF/MF switch on Nikon camera bodies* and there is no second AF/MF switch on the lens for Canon, everything is accomplished by the focus ring. This entry was posted in Brand: Tokina and tagged DSLR, Lens, Tokina. Bookmark the permalink.